The morning sky at Roundtop was attempting to be a “red sky at morning” kind of sunrise, but the overcast was too gloomy for that to be very convincing. 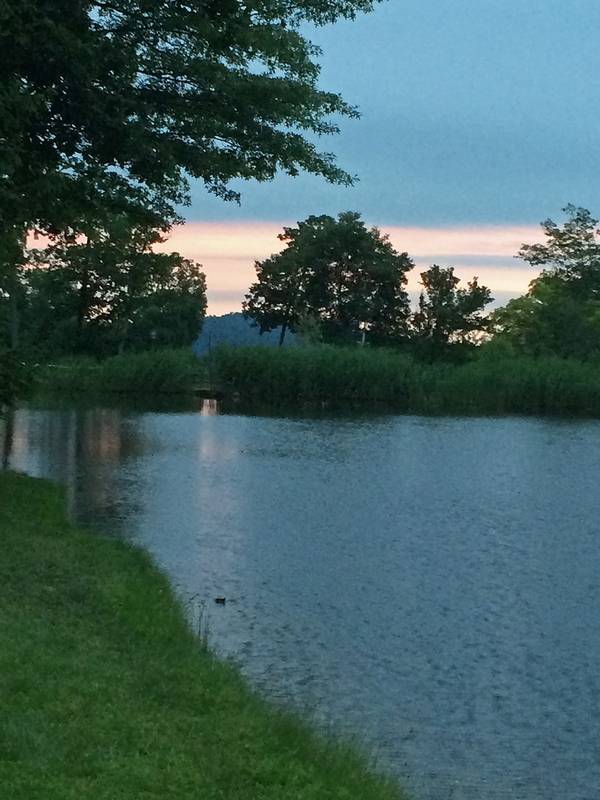 June is ending as it began—with cloudy skies and the chance of storms. I can only hope for July to bring some better weather. Right now it appears unlikely that I will be able to see the near convergence of Jupiter and Venus tonight. They are supposed to appear so close as to look like a double star. For those who may live where the sky will be clear, look to the west just after sunset. 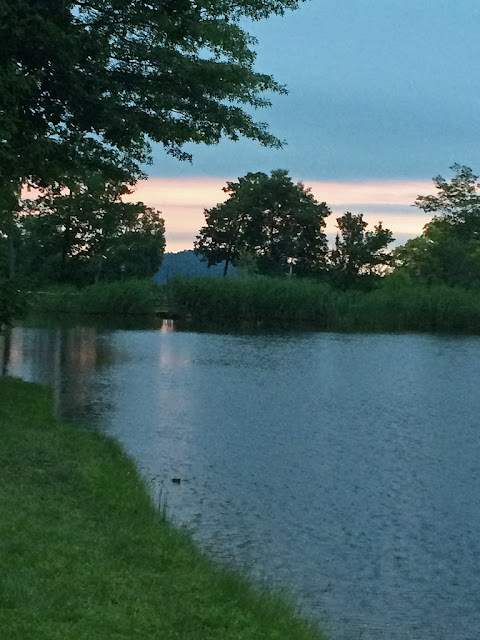 Don’t wait until it is fully dark but look while the sky is still a twilight blue. The two are only 1/3 of a degree apart, and the view is improved with binoculars or a scope, with both planets in the same field of view. Perhaps I will try tomorrow night—they two won’t be quite as close then, but they will still be close and I can only hope the sky will be a little clearer. As far as rainy weather goes, this June was the rainiest ever, with nearly 7” of rain. That makes up for the lack of rain in the traditional month of April. It has also made for some mid-level flooding, not to mention a lack of outdoor fun. Saturday was another full day of rain, often with heavy rain. And rain is expected tomorrow and again on Thursday. Nothing gets the chance to thorough dry out very much. Yesterday was a clearing day—that’s about as good as this June has been. It never actually fully clears, but it gets to the point of clearing weather. Perhaps that’s why I saw a nice buck in velvet in the early afternoon. The buck’s antlers were well above his ears and just starting to branch. He and a lady friend were cropping grass at the edge of the woods. Perhaps they were tired of being soaked in the thick underbrush, too. But they were out of the woods, in the field, munching away and likely drier than in the woods itself. I am ready for a little more pleasant weather, that’s for sure. I have a new chicken run that I haven’t had a free or rain-free day to put together for several weeks. Fortunately, the girls don’t fully need this new run at the moment, but I’d like to get it constructed and ready for them. And I wouldn’t mind putting the rain jacket away for a few weeks, either. 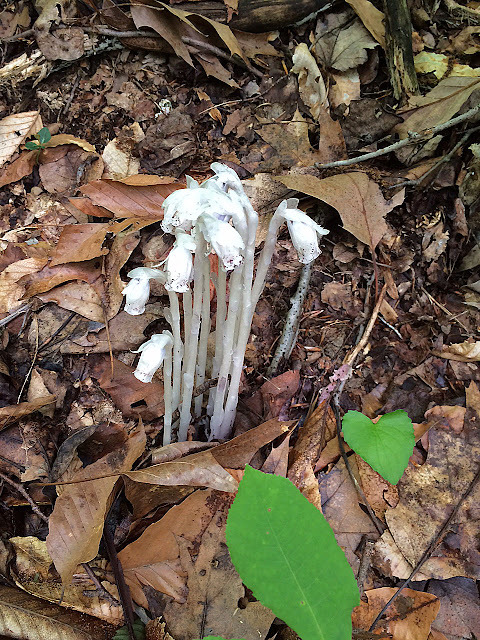 Leopard spots, Indian pipes and red! 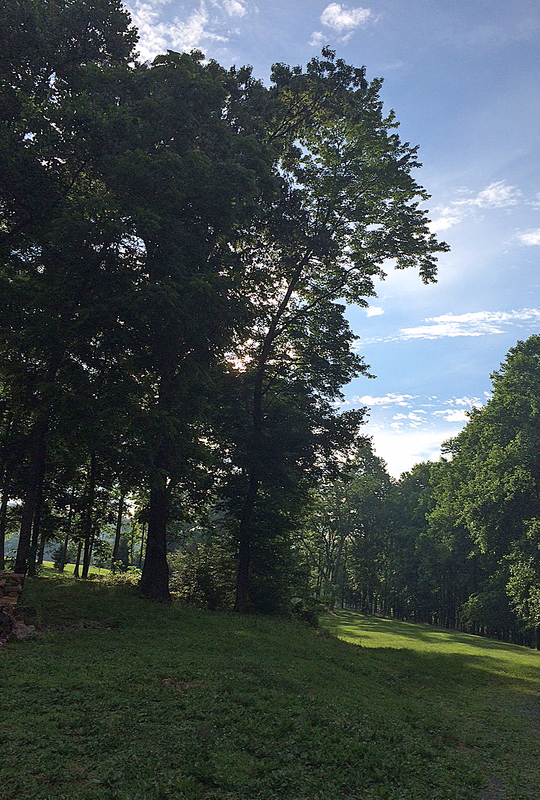 All the rain and storms here on Roundtop have wiped out any rain deficit from a dry spring. Now, it’s turning into a wet and stormy summer, and that is producing some interesting fungi. Summer is not usually the time I look for fungi. Summer is usually time for wildflowers and grass turning brown. Not this year. 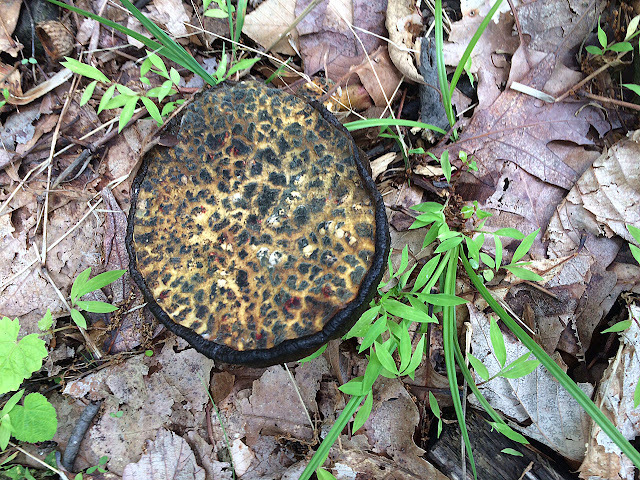 Who knew that fungi could masquerade in a fashionable leopard skin? I have no idea what this fungi is, or rather was. The leopard spots are really the fungus disintegrating, but the effect is pretty neat. 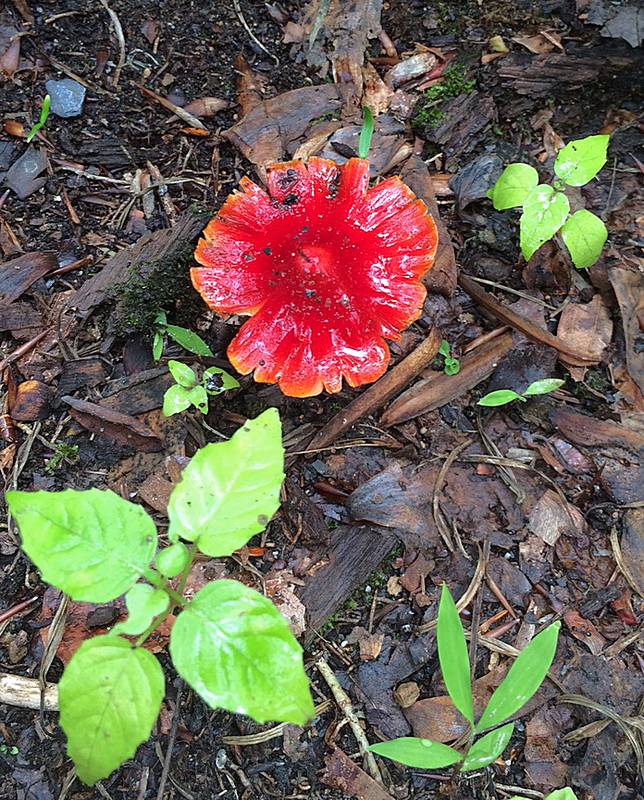 I’m not sure about the name of the red fungus. It may be an older Salamander Fungus but I’m not sure. The Indian Pipes fungus is the first fungus I could name, learned back when I was girl. It’s still one of the most distinctive fungus around locally, in my opinion. Sometimes these can grow rather tall, likely nearing a foot tall, though this nice bunch of them was smaller, perhaps half of that. The first week of adventure camp for this summer has already come and gone. I had the usual batch of kids who know little to nothing about the outdoors. They need to be reminded not to throw sticks and stones, not to shout constantly, not to toss the catch nets or twirl them around like batons. Most have never seen a crayfish, though apparently they have eaten lobster, as that’s the first thing they mention when they see a crayfish. They do like to watch the crayfish fight, though. 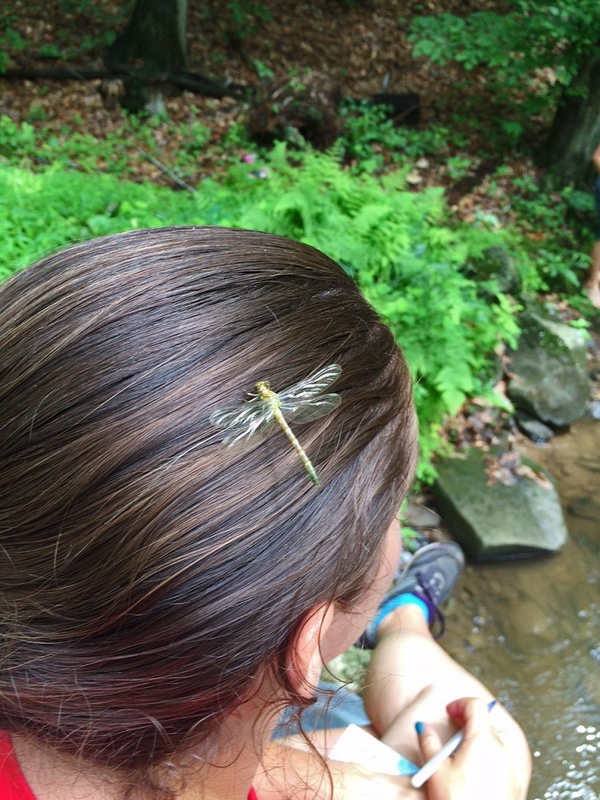 This past week, in addition to the usual stream denizens, we were visited by several flying insects. A dragonfly of some species perched on someone’s head for a minute or so. 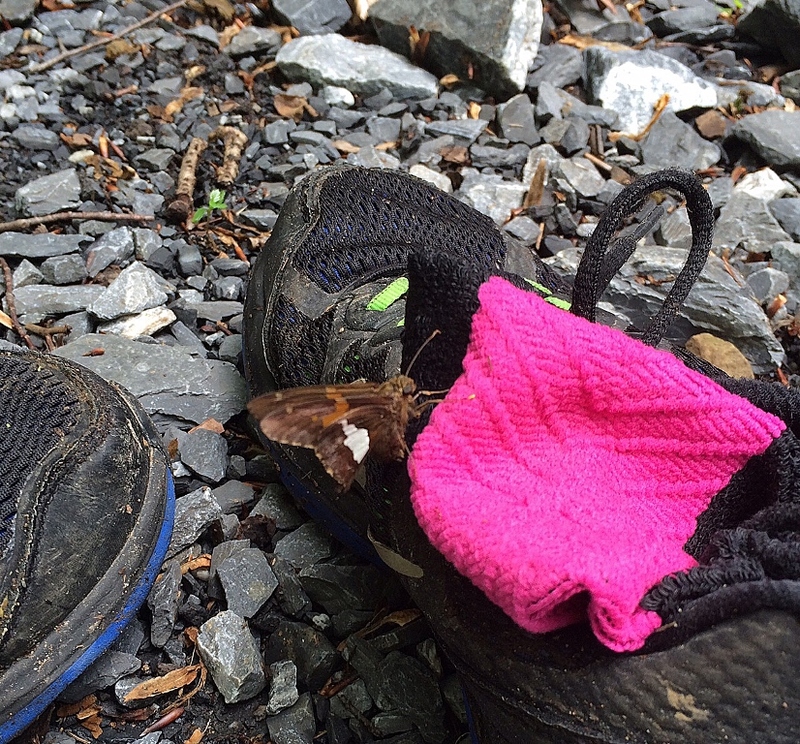 A silver-spotted skipper came to perch on someone else’s shoes and socks. Later, I discovered this species likes blue and purple flowers, so I’m thinking it was attracted by those brightly-colored socks. As always, the kids seem to have a good time, for which I am grateful, and they catch crayfish big and small. This group preferred the tiniest crayfish, while most other groups argue over who’s caught the largest one. We had a few sightings of salamanders, but none made it into my buckets. Before the kids arrived, I fed the local minnows and small fish a few pieces of bread, but this batch of kids was way too impatient to have any luck netting the fish. I can only hope that somewhere along the way, before too long, that these kids develop a much more nuanced relationship with their environment. Right now, the best I can say is that at least they are enthusiastic once they get outside. 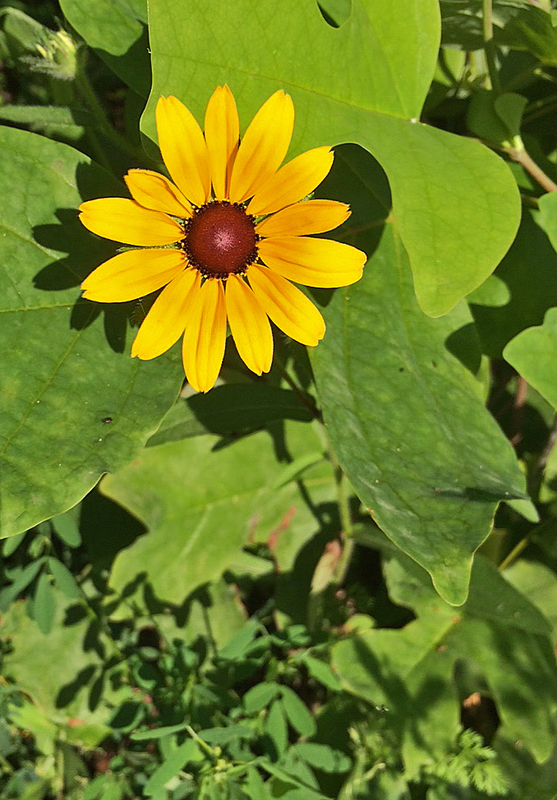 It’s the first and so far only brown-eyed susan of the year. That’s a sure sign of summer here on Roundtop. I’m not a person who cuts wildflowers, though this one always tempts me. What keeps me from doing so is that I’ve read the flowers are toxic to cats, and with my cats they certainly couldn’t be trusted to stay away from any I’d bring into the house. Butterflies and bees alike enjoy the pollen of brown-eyed susans, and the plants are lovely in a wildflower garden if you have full sun. 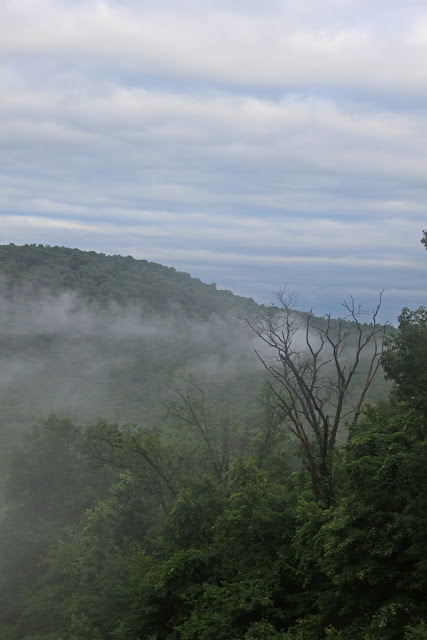 Mid to late June is when I first see them, and my latest photo of one that I posted on Roundtop Ruminations was on November 5. That one was looking pretty ratty. Today’s photo is actually the earliest, by three days, that I’ve posted a photo. That may not mean they are blooming early this year, because unlike with the earliest of the spring ephemerals, I’m not standing around anxiously anticipating their first bloom. July is the month when I see large rafts of them, and I may well have waited until there was more than one before I posted a photo. Adventure camp started on Monday, with my stint down at Beaver Creek with a gaggle of nature-deprived kids set for Thursday. I just saw the weather forecast and am not optimistic. Heavy rain in the morning and storms in the afternoon doesn’t sound promising, though perhaps the forecast will change over the next 48 hours. I hope so. The weather is hot and very, very humid, barely cooling down at all overnight. Yesterday, the chickens were panting, but it didn’t keep them out of the forest, and I don’t think it slowed them down very much. They don’t like heat and humidity very much. At the moment, the only one who appears to be slowed by the weather is me. The foxes are still out at night, barking at all hours. I could sleep through that barking, I believe, but when the foxes bark so does my own pack of canines, and I can’t sleep through that. I have yet to see the young blue jays that hatched in the crook of the American beech tree that borders my driveway. I know they are there—the parent birds are vigilant about any would be intruders. I saw them chase a squirrel the other day, when I’m pretty sure the squirrel was without nefarious intentions and was only on a mission to reach the other side of the driveway. Maybe even squirrels want to take short cuts when it's so hot. I nearly stepped into an invisible groundhog hole that was well hidden by foot-high grass. Even after I thought I saw a hole, I had to stoop down and brush aside the grass to be certain I was seeing what I thought I might be seeing, only to discover I was standing right on the brink of that hole. Another inch and.., well, it sure wouldn’t have been pretty. As a result of that near-miss I am staying to visible paths and not attempting to travel cross-country through the woods—at least not where I can’t see the ground. Adventure camp begins next week, and I need to be able to walk for that! 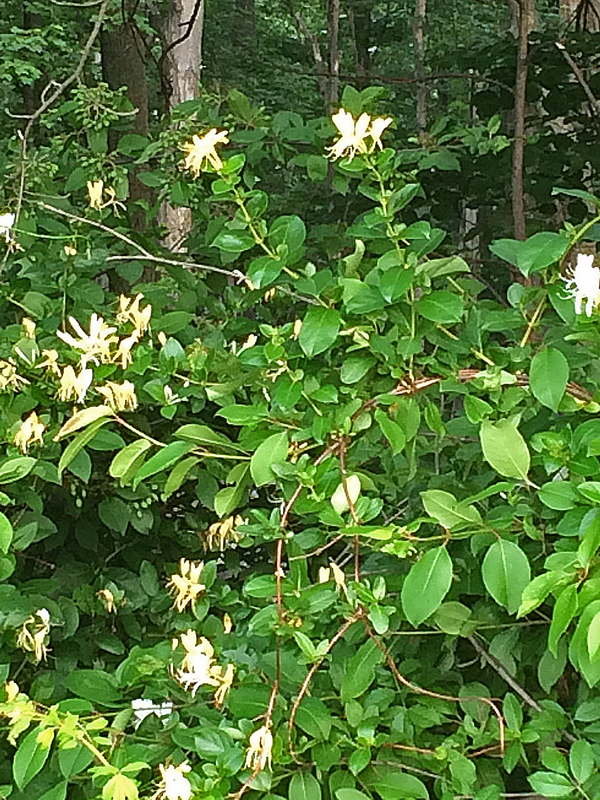 As you can see by today’s photo, in addition to the every-present greens of summer, the honeysuckle is blooming now. I was attempting to reach the bush for a closer view when I was deterred by the groundhog hole, so until I find a patch not guarded by a woodchuck, this photo will have to do. The woods are wet and dripping. The lane is rutted, with fist-sized stones washed up and sitting in the middle. I can’t decide if these are late spring rains or just the usual summer pattern of frequent, torrential evening storms. Certainly the landscape is lush, even tropical, this week. I am not a fan of getting soaked by foliage as I walk around the forest. 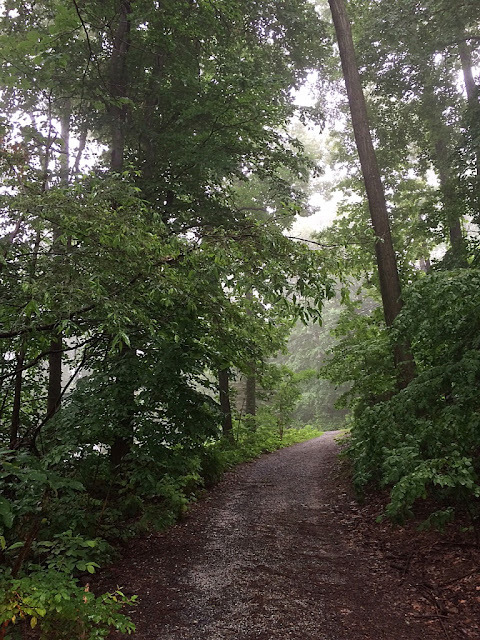 Oddly, I don’t mind walking in the rain nearly as much. Perhaps it’s because I just don’t want to wear a rain jacket when it’s not raining. The mountain residents are all in evidence, even the yellow-billed cuckoo, which I hear frequently but am lucky to see once a year. The fox still barks in the dark hours, and the chickens still roam free, so far safely, during daylight. At the moment I can say not much is going on except the usual things—and the dripping rain. In another week it will be time for another season of adventure camp to begin. I was briefly tempted to make a foray down to the creek this past weekend, just to check the area again. But mud and seasonal streams deterred me. I hope both will be drier next week. Actually, I hope everything will be drier by next week. Rainy week - at last! 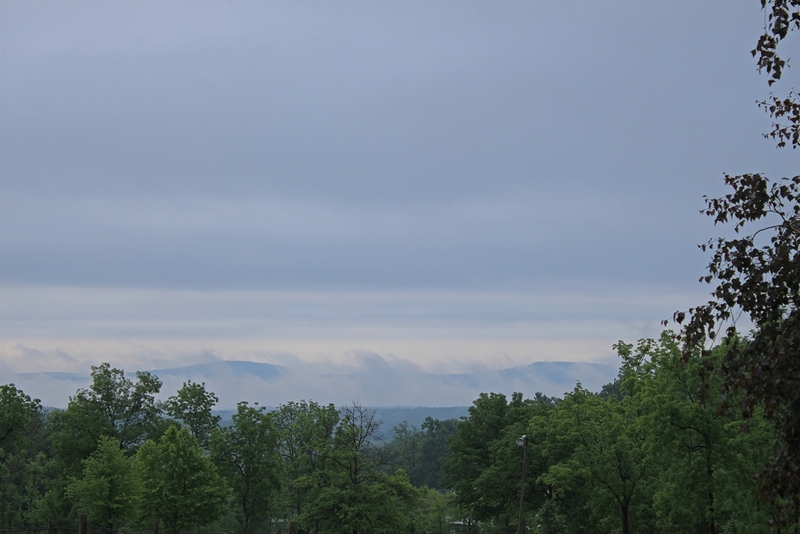 It’s a rainy week here at Roundtop, badly needed and mostly appreciated. I say mostly because on Monday afternoon the rain was as heavy and torrential as I’ve ever seen it. It wasn’t just that I ended up with a bit of water in my basement, but the water was muddy, which has never happened in 20 years. The lane up the mountain is badly washed out, making 4wheel drive even more of a necessity than normal. Since then the rain has continued off and on, but at a much gentler pace than at the start of the week. As a result of the overcast skies, the temperature has returned to April levels rather than that of July. There’s a 30 degree difference between Sunday and Tuesday. I even, briefly, considered lighting the fireplace, but settled for a cozy sweater instead. The temperature change came too late, by one day, to keep May 2015 from being the hottest May since record-keeping began in this area. I guess this is nature’s way of making up for that cold winter, just passed, here in the east. Around my cabin, raindrops and fog covers everything. I can’t walk on the trails without getting soaked. Even when it’s not raining, the slightest breeze drops all that water from the tops on the trees down onto me. Sometimes I can’t tell if it’s rain or just the drops falling. I much prefer this cooler weather, brought to my mountain courtesy of the cloud cover. It’s a welcome respite from hot and humid weather, and I only hope summer’s hotter days are interspersed with some more like it. While a rainy Sunday interferes with my time to get out into the forest, I will not complain about yesterday’s weather. The forest has been too dry for too long, as the spring rains here were meager this year. An inch of rain will not reduce the current deficit, but it certainly helped. This morning raindrops cling to everything, and fog obscures the mountain tops. Birdsongs carry over a longer distance in the thick air. I hear the wood thrush, the ovenbird, an Eastern pewee and the ever-present phoebe. I keep waiting to see the family of blue jays that are nesting in a crook of the beech tree by the side of my driveway, but they are still in hiding. I saw a large snapping turtle a few days ago but didn’t have my camera with me, and despite a quick retreat to the cabin to get it, the turtle was gone when I returned. Such is life. Walking with a dog and a camera, or at least my dogs, is a recipe for disaster. And it’s probably just as well that Skye didn’t get to meet the snapping turtle, too. Can someone help me with the flower ID in today's photo? 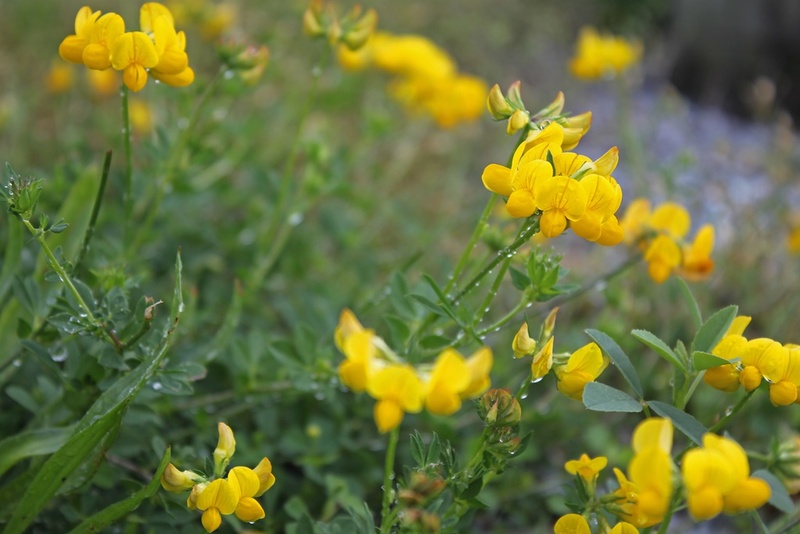 Is it a monkeyflower?